Pembleton is an avid reader of the local animal paper. When he spotted an ad for 1 free yoga lesson for beginners, he decided that he and Blizzard were going to check it out. Ducky and Ted didn’t want to be left out, so they tagged along. At first the yoga lesson was pretty easy. There was a lot of inhaling and exhaling, reaching for the sky and wiggling their toes. Then things got a little more advanced. Cat pose was challenging but doable. 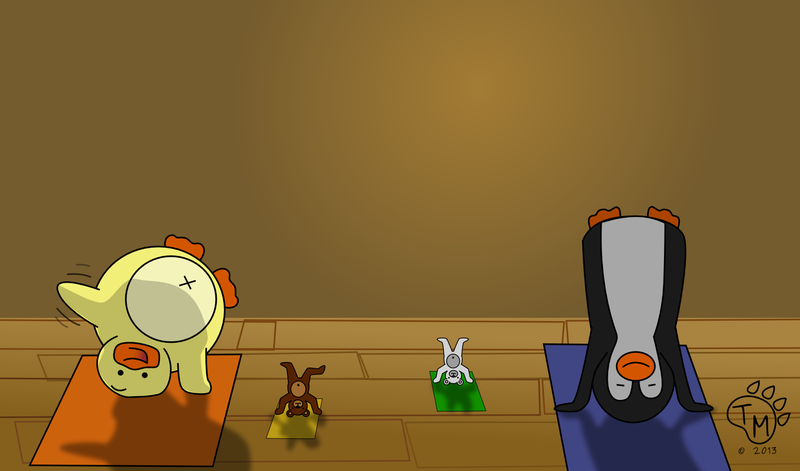 Downward dog was easy for Ted and Blizzard, but a little more challenging for Ducky and Pembleton, because they have shorter arms. Then there was the headstand. This one was tricky, but the gang were fast learners. During the cool down period, the instructor turned the lights down low and played some soothing music. So soothing, someone (we won’t mention who) fell asleep and was snoring loudly! After the class was over, the Yogi was so impressed with the gangs yoga skills, he invited them back next week for a free advanced level class. « Take Us Out to the Ball Game!